Here is our range of various duty Glue Guns & Glue Sticks, our range comprises of glue guns & replacement glue sticks that are perfect for light, medium and heavy duty use. 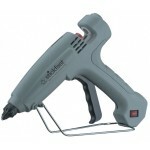 Our Glue Guns are perfect for arts and crafts, fastening cardboard boxes or other packaging materials, and a range of other uses. You will also find our replacement glue sticks for each model Hotmelt glue gun that we stock and for certain models the air compressors that can be used in conjunction.